With only eight days left to Christmas, we've compiled a few items for that special quilter in your life. From thimbles, irons, books, quilt kits, organizational items, and much more there is bound to be something on this Quilter's Wishlist for your quilter. 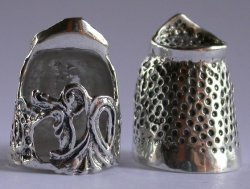 Handcrafted sterling silver thimbles from TJ Lane. Variety of styles and sizes. 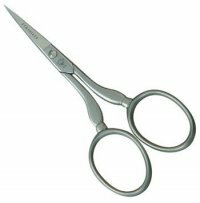 These are a quilter's dream scissors. Crafted from steel, these will last forever. We have a variety of sizes and styles. We also offer 3 piece sets with cases. 10W LED desk lamp offers Tri-Color Technology giving you three color spectrums. With a touch of a button switch between warm, natural and cool light. Stella has a 5-level stage dimming capabilities and a flex arm that allows you to get light exactly where you need it. 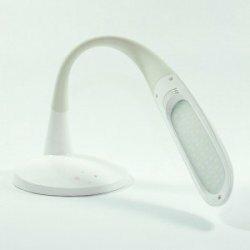 The LED light produces very little heat. No UV light and no bulb replacements (50,000 hour lamp life). 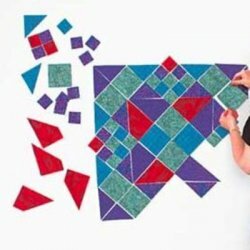 This design wall will have you laying your quilts out in no time. Measuring 72"x72" preshrunk 100% cotton flannel has no seams or obstructions. It is fully portable, collapsing down to 5"x5"x22" and weighs less than 7 pounds. Convenient for home or retreat use as it assembles in just minutes and only requires 18"x72" of floor space. 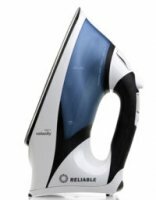 Internal motion sensor releases steam with ordinary movement of the iron. Reliable - no spitting, no leaking, no kidding technology and auto shut off bypass are features to depend on. With its patented two heating element design, the Velocity V50 won't let you down. For sewers and quilters, the steam ready feature means the Velocity will be ready to work when you are ready. 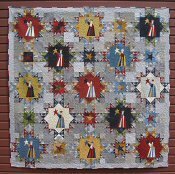 This stunning quilt from Jen Kingwell Designs is 80" squared finished. 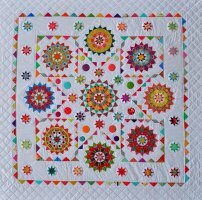 You'll receive all the fabric needed to create this bright and cheerful quilt. Fabrics and quilt designed by Howard Marcus, this quilt is lovely. This quilt supports St. Jude's Hospital. 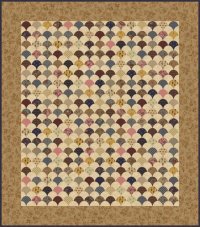 Kit includes project sheet, more than 600 precut clamshells, template, and fabric for the quilt top and binding. Finishes 61"x69." 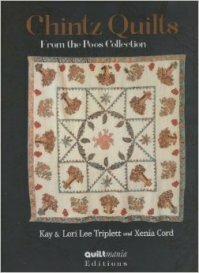 This book features 36 magnificent antique chintz quilts from the Poos Collection with color photos of the complete quilt and closeups. Information and research is provided about each of the quilts as well as the history of chintz. This book is a must have for quilt historians, antique quilt lovers, and quilters who will be inspired by the images and workmanship. Their newest book from Quiltmania. 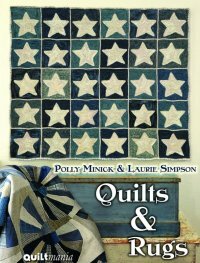 With over a dozen new projects and 184 pages of beautiful quilts and rugs designed by Polly Minick and Laurie Simpson, this book is sure to be a favorite. Contains 8 classic patterns reissued. 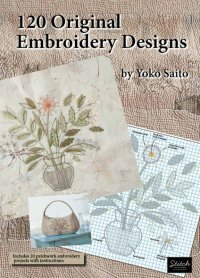 This book from Yoko Saito contains 120 original designs for a variety of project types. Like all of her work, these designs are detailed and unique. This is a great addition to any embroiderer's collection. 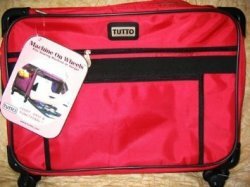 Tutto Machine is the ultimate sewing machine travel case. This sturdy, but lightweight case, turns on a dime, stacks up to 150 pounds and folds to 3" thick for storage. The sewing machine bag has both top and front openings for easy access. There are inside straps to hold your machine secure, as well as pockets to organize your sewing tools and fabrics. This phenomenal little light is bright, flexible, and efficient. 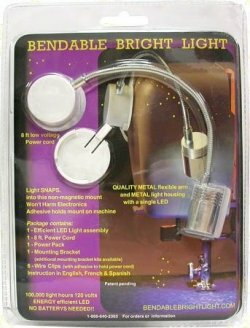 Features white plastic base and mounting bracket, chrome colored flexible arm and light housing, 8 foot low voltage power cord, LED bulb (100,000 light hours), 120 volt/60hz input, dc6v/300ma output, mounting adhesive, white plastic cord clips, and tri-lingual instructions. Each Super Satchel cube comes with instructions and all hardware for easy assembly. In addition, the interior walls of each cube are pre-drilled with a series of rows of ports to accommodate a custom designed rail, which acts as a support system. 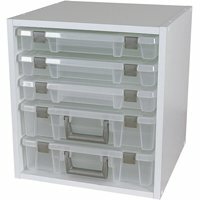 The Super Satchel boxes can not only be stored, but slide out for easy access to all of your supplies. Each Super Satchel Cube comes with 6 sets of rails, which allow you to store both slim and deep Super Satchel Boxes. The tops and bottoms of each cube are pre-drilled and include pegs for a stacking option. Caps for the top holes of each cube are also included for a finished look.